I am new to the forum and I am really happy to be here. I am facing a problem with my Toshiba c660-13r (short model no. PSC0LE) and I was wondering if someone could provide some help. I updated to the latest bios (v170) from the toshiba site but no luck. Can anyone please help with this issue? I would really appreciate it. 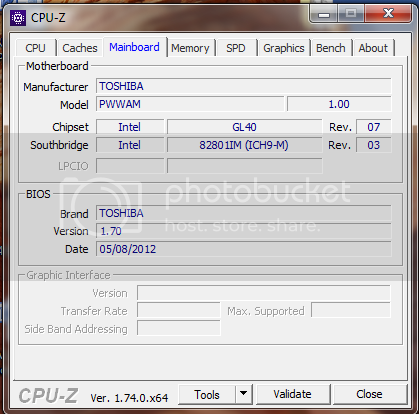 Post screenshots of first(CPU) & third (Mainboard) tabs of CPU-Z. 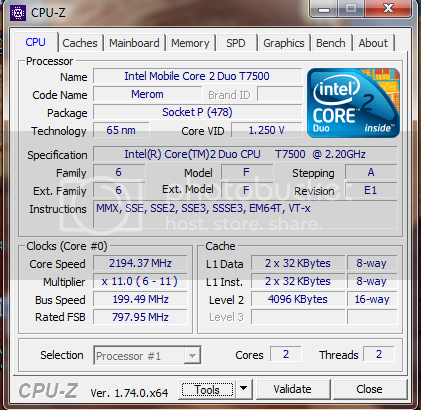 (11-20-2015, 12:58 PM)DeathBringer Wrote: [ -> ] Post screenshots of first(CPU) & third (Mainboard) tabs of CPU-Z. And your Core 2 Duo T7500 has CPUID=0006FA. First microcode is useless and can be replaced with new one for 0006FA. So this means that nothing can be done? Should I find a CPU with one of these microcodes? You can try to replace microcodes. Can you please tell me where I can find information about how I can change microcodes? I am all new to BIOS modding. I've made mod for you. (11-20-2015, 01:32 PM)manouallou Wrote: [ -> ] Can you please tell me where I can find information about how I can change microcodes? I am all new to BIOS modding. So, if I had bought a T7100 it would work OK? Based on this page from CPU-World the CPUID of the T7100 processor is 6FD as the one in the BIOS you analyzed. (11-20-2015, 01:41 PM)DeathBringer Wrote: [ -> ] I've made mod for you. Really? I am so grateful! Thank you. I will try to install it now and post back the results.